Friday Show & Tell ~ Knott’s Berry Farm | The Happy Wonderer ~ ellen b. This photograph was taken of my parents at Knott’s Berry Farm in Buena Park, California in the 50’s. A big treat for my family was going to Knott’s Berry Farm and eating one of the famous Chicken dinners and finishing off with boysenberry pie. We very rarely (almost never) ate out as a family so this was a big treat. 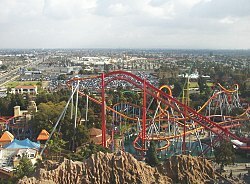 These are some newer photos of the amusement park. In the 1920s, Walter Knott (December 11, 1889–December 3, 1981) and his family sold berries, berry plants and pies from a roadside stand beside California State Highway 39, near the small town of Buena Park. In the 1930s, Walter Knott was introduced to a new berry which had been cultivated by Rudolph Boysen. The plant was a combination of the red raspberry, blackberry, and loganberry. Walter planted a few plants he had received on a visit to Boysen’s farm, and later started to sell them at their roadside stand. When people asked him what they were called he said “boysenberries”. In 1934, Knott’s wife Cordelia (b. 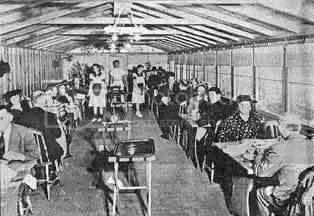 1890 – d. 1974) began serving fried chicken dinners, featuring boysenberry pie for dessert. As Southern California developed, Highway 39 became the major north-south connection between Los Angeles County and the beaches of Orange County, and the restaurant’s location was a popular stopping point for drivers making what at the time was a two-hour trip. Until the development of the 605 and 57 freeways in the late 1960s, Highway 39 (now known in Orange County as Beach Boulevard) continued to carry the bulk of the traffic between eastern Los Angeles and Orange Counties. Within a few years, lines outside the restaurant were often several hours long. To entertain the waiting crowds, Walter began to build a ghost town in 1940, using buildings relocated from real old west towns such as Calico, California and Prescott, Arizona. They added attractions such as a narrow-gauge train ride, a pan-for-gold area, and the Calico Mine Ride. Frequent activities at what Knott called a “summer-long county fair” included — naturally — boysenberry pie eating contests. When Disneyland was built in nearby Anaheim, the two attractions were not seen as direct competitors, due to the different nature of each. Walt Disney visited Knott’s Berry Farm on a number of occasions, and hosted the Knotts at his own park. The two Walters had a cordial relationship, and worked together on a number of community causes. For more Show and Tell head over to There’s No Place Like Home. As of June 2017 Photobucket has blacked out all my photos that I had stored there and are holding them hostage. Hopefully I can update my photos on all the posts they have ruined, over 4000 of them. Posted on November 8, 2007 by Ellen •	This entry was posted in California, Family, History, Photography, Show and Tell. Bookmark the permalink. I like to hear about businesses coming from way back. That is busy dying out here by us. Oh how fun! I have a very similar picture taken of me at Knott’s Berry Farm in the early 60’s with my cousins in almost the same wagon! I’ll have to find it and share it with you. I loved KBF growing up. What a great Show & Tell! Thanks! That was a very interesting story, thanks for sharing! I’ve never heart of Knott’s Berry Farm here in Germany but it seems to be very popular in the US, isn’t it? It amazies me that Walter Knotts already started entertaining people in 1940, wow! Have a great S&T Friday! I well remember Knott’s Berry Farm. My husband and I went to Disneyland and Knotts Berry Farm for our honeymoon over 40 yrs ago. I still remember the chicken dinner and have a menu tucked away. I loved the picture of your grandparents! and what a great story of the farm, what a huge development! Amazing. Love the story and the shared photos. Boysenberry pie, huh? Boy, does that dessert bring back memories!! Ahhhhhhhh, the 50’s!! It was a great decade. My S n T is posted. Drop by if you can find time, won’t you? oh dear… sweet picture of your parents. I lived in Orange County for many years and as a teenager I used to go to Disneyland and Knotts all the time to hang out with friends.. hmmm memories. thanks for the share .. I had no idea about the history of Knotts Berry Farm. Always nice to learn a little something along with having fun. Great post. I just love the photo of your parents…It is pretty obvious they are having a wonderful time. I visited Knotts Berry Farm in 1955 so this brought back memories! OH! My grandparents used to take us to “Knottsberryfarm” when we visited them in Norco in the early sixties and beyond. I didn’t know that it was a berry farm until I was ten or twelve. I thought it was all one word. My grandpa had so much fun with that–every time he became part of the schtick. I still love boysenberry syrup on my pancakes and waffles and I ALWays think of Knottsberryfarm. This was great fun. I’m sending my sister the link. She’ll love this!! Cool photos! Sounds like a great place to visit! That is a fabulous picture of Mom and Pop! You historian you with the background on Knotts – you are too funny – Love it! What a fabulous picture of your parents! What fun. I had heard of Knotts but didn’t know the background. I’m glad Knott and Disney weren’t rivals. Interesting1 I have heard of Knott’s Berry Farm all my life, but never knew the story. What nice memories with your family! This is a great story and picture. We went there on our honeymoon 35 years ago, but I don’t think we got to eat a meal. Thanks for stopping by today – I posted an Edit to tell where the books can be found, if not in the library any more. Wow, what great pictures and memories! I can imagaine that it was a great treat for your family to visit there. this is cool mom! nice. Beautiful photos. I especially like the first one. Thanks so much for sharing. The amusement park looks like a lot of fun. Wonderful photos. I know some people think they’re cheesy, but I always love those staged photos at amusement parks and such, I think they’re lots of fun! Wow, Ellen, great photos and great memories. I was there when I was 6 and again once when I was 26. Now . ..I want to go again. Perhaps I will in a few years with the next generation. Thank you sweet lady for stopping to visit me. Love…Love your parents picture…you are blessed to have these pictures too! I so enjoyed my visit and will certainly be back! A very interesting story and great pictures to boot! Thanks Ellen! Wow that’s crazy – what a wonderful photo of your Mom and Dad! What fantastic photos, Ellen!! I love the information that you gave about the Knott’s Berry Farm – I love history, especially when it’s about local cultural things like Knott’s. Really cool! Also, I just checked out your profile for the first time and wanted to compliment you on the lovely photo of you and your gorgeous family (your dress is so chic!). I, too, have an elementary education degree and am a homemaker. I remember in the 70’s, my maternal Grandmother Dorothy would always bring us sample jams from Knott’s Berry Farm. How neat! I too had never heard of this….. what a fun family trip!! That was interesting to read about Knotts Berry Farm. Fun to see the pictures of it and your parents. Oh I love Knott’s Berry Farm!! I went twice—this was 30 years ago! This is such an interesting post about the knotts berry farm. It is interesting to find out about what they used to grow on the farm and how it became an attraction. This would make a great guest appearance post on my website if you would like to appear. When I do a guest appearance I write an introduction about the person/website with a link to their site and then I post the article about some aspect of farming. let me know if you would be interested. I love Knotts! It is our familie’s favorite theme park. I think it is so cute. Thanks for all the info about it! Hello, Ellen. My name is Bob Barber and I am the webmaster for bear-ytales.net. It is the only Knott’s fan site that I know of, focusing mostly on today’s Knott’s, but slowly publishing pictures of it’s past. I really enjoyed you report, especially the picture of your parents in the wagon. If you have other historic pictures you would like to donate to the site, I’d be happy to post them and give you credit of course. If you are interested, please email me here or via the website. OH.MY.WORD. That is hilariously cute. Did Walter Knotts Find LOST SPANISH TREASURE GALLEON IN 1960’S I FOUND SATILITE IMAGE TAKEN IN 1961 THERE ABOUTS HE DONATED HIS LAND TO SAN BERNADINO CA. IN 1966!! !